The future of personal dive computers, powered by an OLED colour display and Bluetooth technology, has arrived. Cutting edge technology coupled with powerful features could not be any easier to experience. Features include a hoseless, air-integrated computer with patented air time remaining algorithm. 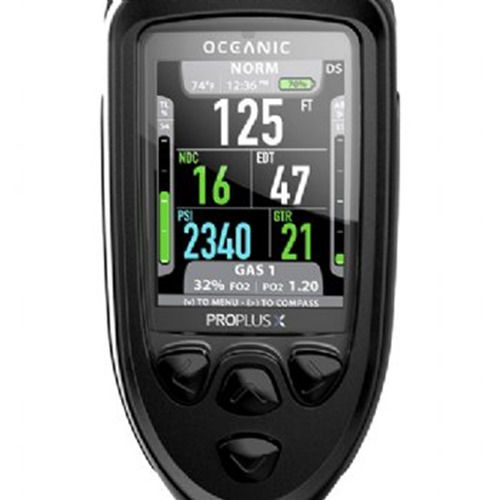 High contrast OLED colour screen, 3-axis digital compass, Bluetooth ready, up to 4 nitrox mixes, user replaceable battery, and an intuitive push button menu system. Note: the Oceanic VTX was formerly the Aeris A300 CS and has been re-branded due to the merger of Aeris and Oceanic. The features and functionality of the Oceanic VTX are identical to the Aeris A300 CS. The Oceanic VTX OLED dive computer project started with a desire to create an experience that was simpler, more useful, and more enjoyable - while building on the things people already love about Oceanic dive computers. It has a completely new structure applied across the whole system that brings clarity to the entire experience. The displays and interface are purposely unobtrusive, clutter has been stripped away and unnecessary data and icons have been removed. In taking away elements that don't add value, there's greater focus on what matters most... your dive. It's about showing you what you need to see, when you want to see it. That's it. Simple. When we can produce such a powerful, feature-rich dive computer that you can pick up for the first time and already know how to use it, we've done our job! With an easy-to-use interface, amazing readability, powerful features and simplicity at its core; the Oceanic VTX OLED dive computer is the new benchmark for modern dive computer design. 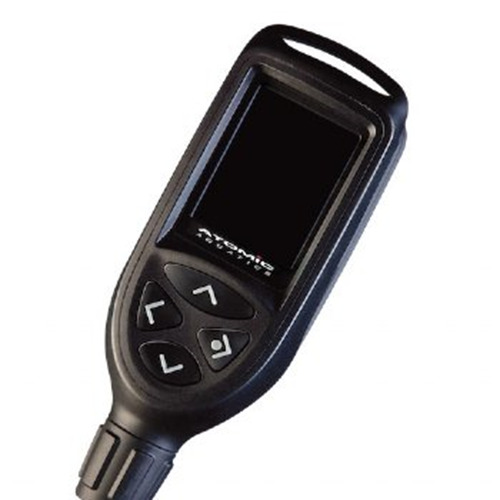 The Oceanic VTX OLED dive computer is engineered to take full advantage of Bluetooth technologies; interacting with your dive computer before and after the dive couldn't be any easier. The DiverLog for iOS App makes it even easier to set up your dive computer and lets you do more after the dive than ever before. 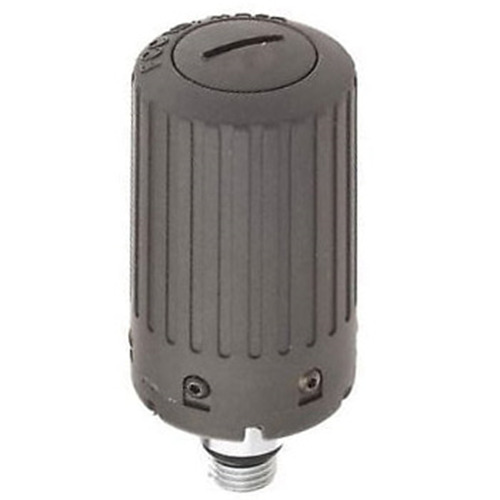 Get full remote control of all dive computer settings. View log and profile data, add location, notes and other details. Share your favourites via e-mail, Facebook and more with Oceanic VTX OLED dive computer. Wirelessly update your VTX firmware on the go for the latest features and best performance. Ultra-bright high contrast full colour OLED display with intuitive colour identification of critical dive data. The Oceanic VTX OLED dive computer is Bluetooth ready for wireless transfer of dive profiles and dive computer settings. Compatible with soon-to-be-released PC, Mac and iOS applications. Advanced features for today's technically-savvy diver, yet comes out-of-the-box-simple for new or less frequent divers. Powered by Dual Algorithm™ allowing you to choose the decompression algorithm that best suits your diving needs without compromising safety. Hose-less air-integration with patented Air Time Remaining algorithm provides calculations in real time, allowing accurate gas management. 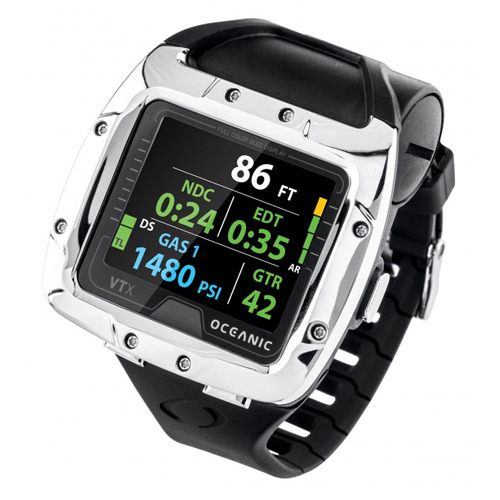 The Oceanic VTX OLED dive computer offers 3-axis digital compass with full-tilt compensation. Up to 4 Nitrox mixes - each with individual PO2 set points. The Oceanic VTX OLED dive computer has a optional deep stop with countdown timer. Intuitive push-button menu interface with "step back" allows for easy settings preview and edits while viewing the menus. User replaceable battery with 30-40 dive hour life*. Data retention maintains settings and calculations between battery changes. *Battery life varies depending on several factors including display intensity setting (user adjustable on surface and underwater), water temperature and age of the battery. Use may be extended by dimming the display underwater. Navigation menu with "step back"